In a perfect world, it would rain beer! Herbie pointed to a dilapidated old aeroplane with a devilish glint in his eye. As the flying machine bumbled through the clouds, they jettisoned generous amounts of maltz, houblon with a touch of leche. 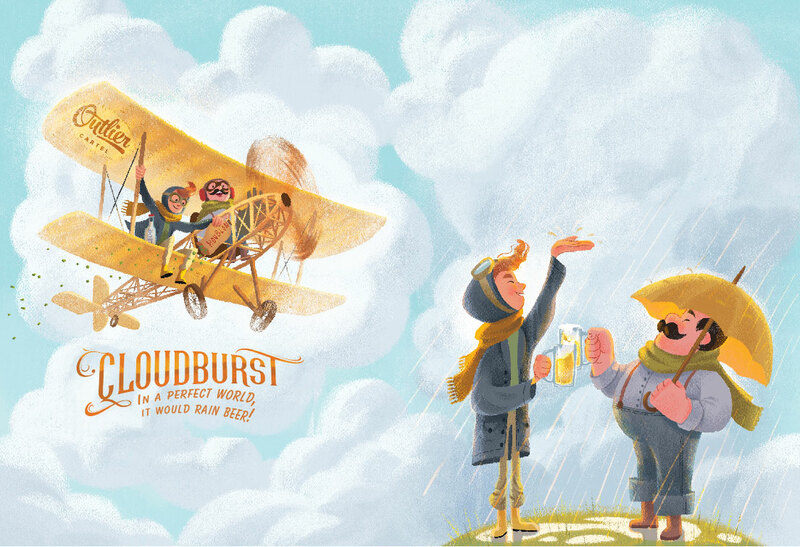 The clouds swelled and rumbled until they burst forth with beer. All the dry, empty mugs overflowed and people below rejoiced as beer fell from the heavens. Thus began Outlier Cartel’s new adventure in beermaking! This beer represents Outlier Cartel going back to its roots, this time doing a full flavoured double cream IPA. Its a cloudy, juicy beer with a strong, but balanced hops profile. At first we had a completely different concept for this, but we couldn’t quite agree get everyone in Outlier Cartel. We needed to have something submitted in time for Great Australasian Beer Spectacular, and Carlos came up with an awesome recipe, but our initial take on the design just wasn’t working. It was January, and a very hot day in Auckland. I had spent all weekend trying to come up a compromise that the entire team would like. I was stuck, but inspiration can come from an usual chain of thought. That morning, I just finished chatting to my friend Anja in Warsaw, who inadvertantly planted a seed of inspiration. Later that afternoon, I was meeting up with Carlos, so naturally my thoughts were on beer. While I was walking across town, was searing hot outside. I actually wished it would start raining so it would cool down. I also wished I had a beer. Then I remembered my conversation with Anja. So then it all naturally came together, would it perfect too kill too birds with one stone, what if it actually rained beer? At that point, I know that Herbie and Carmichael had to come to the rescue! I talked to Carlos and Alvin and they both loved the idea. So immediately began sketching the concept in my notebook. I then got in touch with Sheyda, who happens to be a close personal friend of Herbie and Carmichael and in our own way, we made it rain (beer)! So the next time, you are outside on a hot sweltering day, keep your eyes to the sky for Herbie and Carmichael, and don’t forget to hold out your mugs!